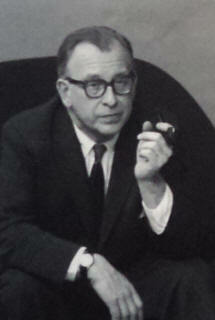 Eero Saarinen was born in Hvitträsk, Finland, and emigrated to the US in 1923. He grew up within the community of the Cranbrook Academy of Art in Bloomfield Hills MI where his father Eliel taught. 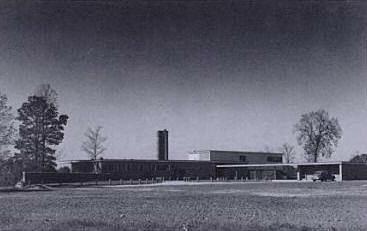 Saarinen studied there and took courses in sculpture and furniture design. He had a close relationship with fellow students Charles and Ray Eames, and he became good friends with Florence (Schust) Knoll. Beginning in 1929, he studied sculpture at the Académie de la Grande Chaumière in Paris then studied at the Yale School of Architecture, finishing in 1934. After that, he toured Europe and North Africa for a year, Finland for a year, then returned to Cranbrook to teach in 1936. He became a US citizen in 1940. Saarinen worked for the Office of Strategic Services (OSS) during WWII, assigned to provide designs for the Situation Room underneath the White House. The first major work by Eero Saarinen, in collaboration with his father, was the General Motors Technical Center in Warren, Michigan. 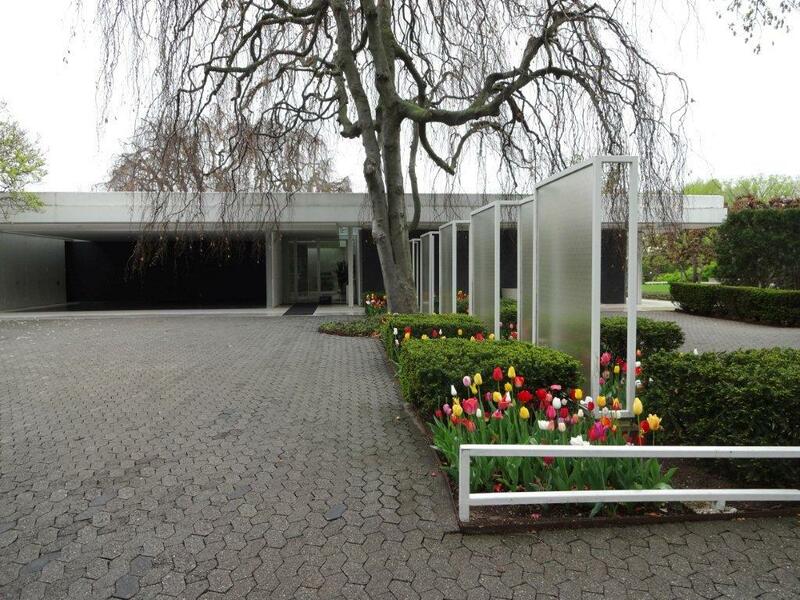 After his father's death in 1950, Saarinen founded his own architecture office. He met his first wife, Lily, an Olympic athlete and sculptor, at Cranbrook, at the same time he met the Eames. He had two children from his first marriage, Eric and Susan. In 1954, after his divorce, Saarinen married Aline Bernstein, an art critic at The New York Times. 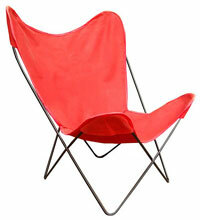 They had a son, Eames, named after collaborator Charles Eames. Saarinen served on the jury for the Sydney Opera House commission that selected Jørn Utzon. 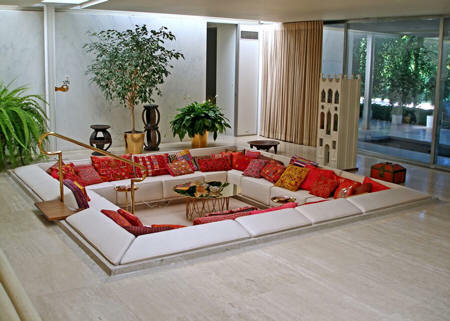 Besides architecture, Saarinen achieved fame as a furniture designer. During his long association with Knoll he designed many important pieces including the "Grasshopper" lounge chair and ottoman (1946), the "Womb" chair and ottoman (1948), the "Womb" settee (1950), side and arm chairs (1948-1950), and his most famous "Tulip" or "Pedestal" group. 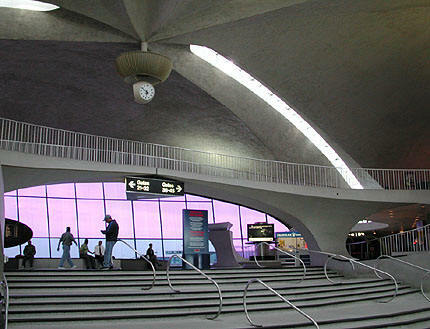 Saarinen's major commercial works include the Gateway Arch in St. Louis, Dulles Airport, the TWA terminal al JFK Airport, the GM Technical Center in Warren MI, and corporate headquarters including John Deere, IBM, and CBS. 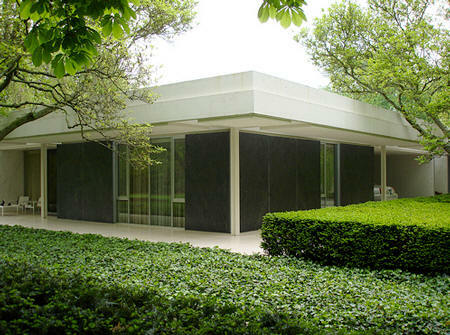 His firm was located in Bloomfield Hills MI until 1961 when it moved to Hamden CT.
Saarinen died while undergoing an operation for a brain tumor at the age of 51. His partners, Kevin Roche and John Dinkeloo, completed his ten remaining projects, including the St. Louis arch. He won the AIA Gold Medal in 1962. His papers were donated to the Smithsonian. The name of the firm was changed to Kevin Roche John Dinkeloo and Associates, or Roche-Dinkeloo. 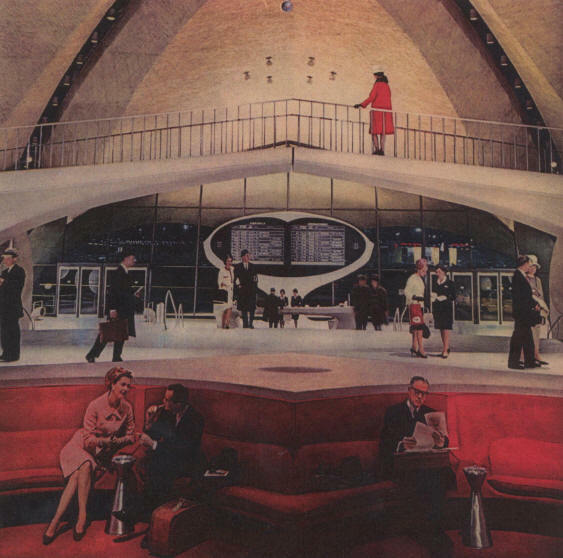 Saarinen TWA Terminal at JFK Airport. A hotel was added on in 2019. 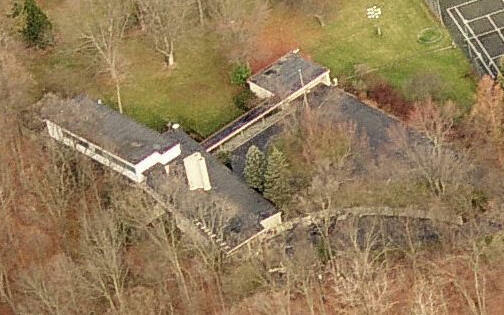 1938 - The Jesse F. Spencer House, 8634 Nadine Avenue, Huntington Woods MI. Commissioned 1937. 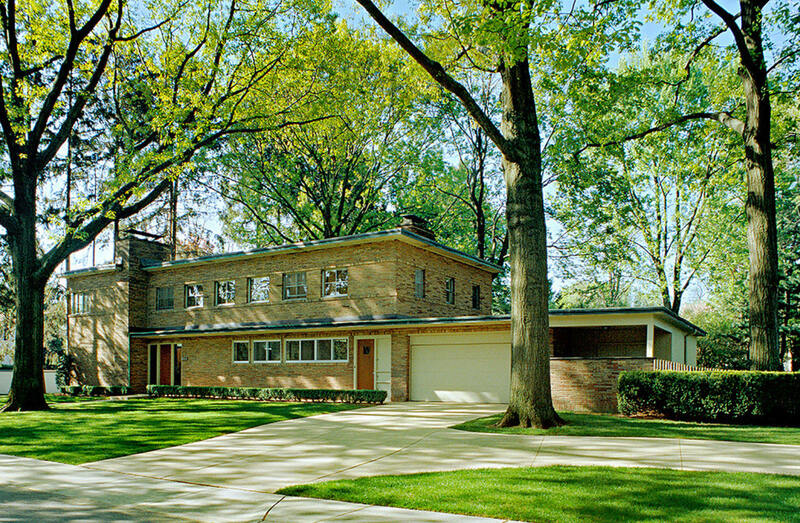 Saarinen’s first built commission independent of his father. 1700 sf. The garage has subsequently been converted to living space; the room shingled; the windows replaced and in some instances reduced. 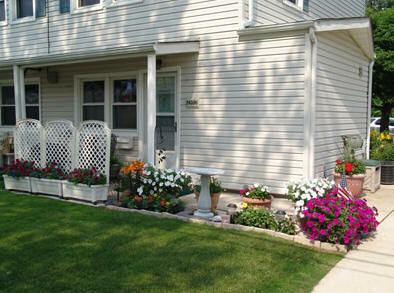 Sold to David and Laurie Glass, who did a remodel in 2009. 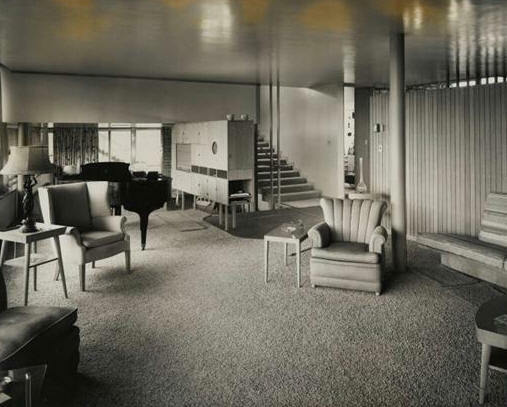 1940 - The Charles J. and Ingrid V. Koebel House, 203 Cloverly Road, Grosse Pointe Farms MI. Commissioned 1937. Designed with Eliel Saarinen. 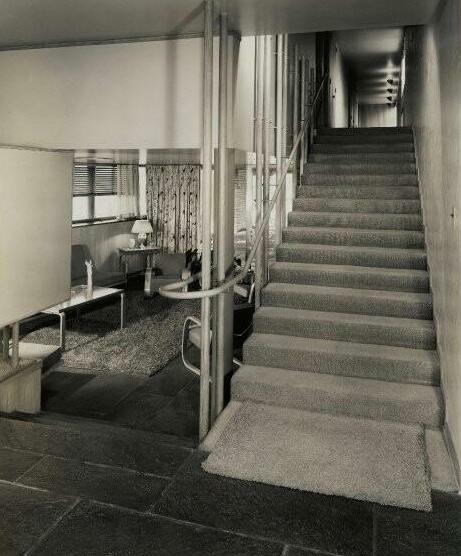 Eero Saarinen's sister Pipsan Saarinen Swanson was the interior designer. Her husband Robert F. Swanson prepared final plans for the house in October 1939. 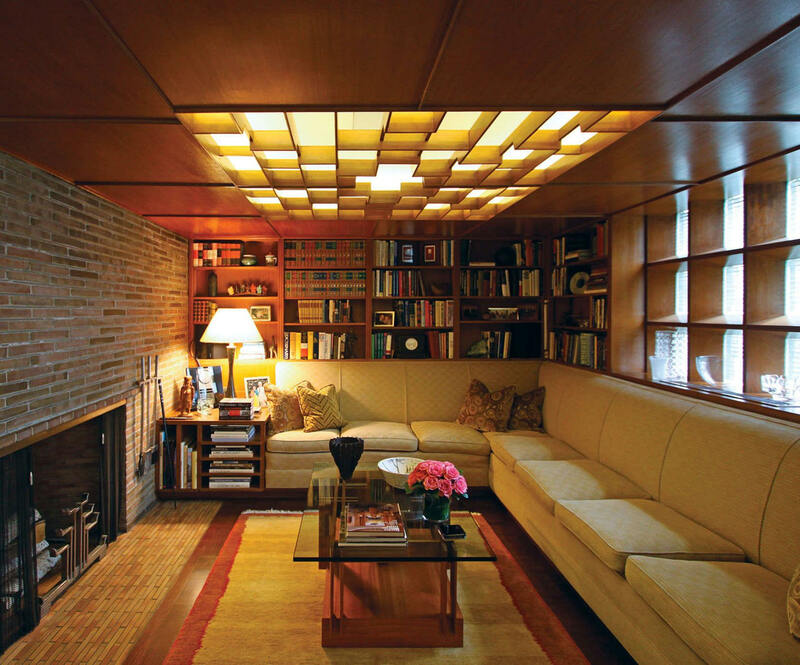 Other members of the Saarinen family provided additional design elements, including custom-woven textiles and art objects. 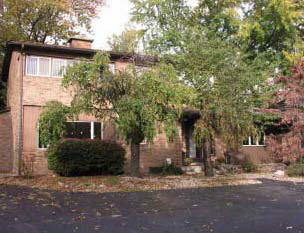 The two-story, five-bedroom flat-roofed house is 5600 sf. In 1985, James A. Kelly and Mariam C. Noland bought it from the Koebel family and restored it to its original condition. In 2009 it was listed on the National Register of Historic Places. 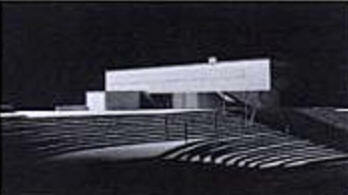 1941 - The Samuel Bell House, New Hope PA. Unbuilt. 1942 - The Al C. Wermuth House, 15315 Tonkel Road, Fort Wayne IN (Leo-Cedarville area). Designed by Eliel Saarinen, Eero's dad. Wermuth was the contractor for many buildings at the Cranbrook School in Detroit, where Eliel Saarinen was director. Commissioned 1941. Featured in the 1949 LOOK Magazine about Fort Wayne IN entitled "America's Happiest Town." Sold to Paul J. Gentile. Sold in 2012 to Rick L. James. 1942 - The Unfolding House was two sections that could be shipped anywhere and "unfolded" to allow a interior modular system. Designed to meet WWII needs for defense housing. Unbuilt. 1942 - The Kramer Homes, 8830 East Ten Mile Road, Center Line MI. Designed to house WWII workers. Commissioned 1941. The government erected eighty-seven buildings totaling 500 units. Upon completion, the development had its own playground, parking lots, circular streets, and large expanses of lawn. 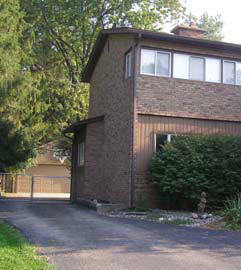 The housing units were built of solid redwood and each unit had a front and a back entrance opening onto small yards. 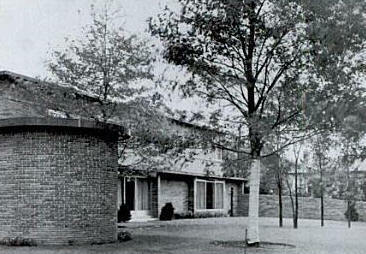 Kramer residents bought the housing development from the Federal Government and formed a housing co-operative in 1949. 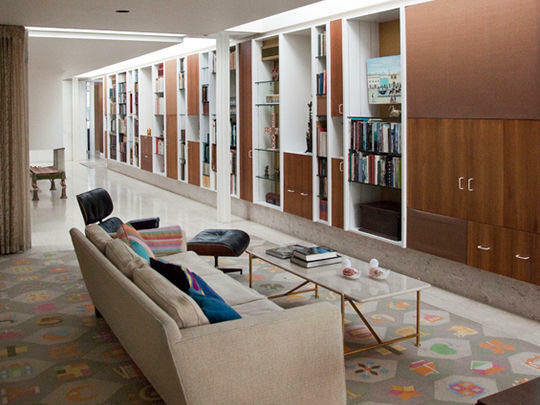 In 1967, Saarinen's modernist design was completely obliterated through a series of remodels. Photo is from approximately 2005. 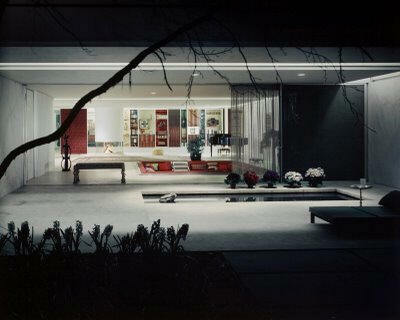 Around 1951 - The Loja Saarinen House, 1045 Vaughn Road, Bloomfield Hills MI. She was Eliel Saarinen's wife. 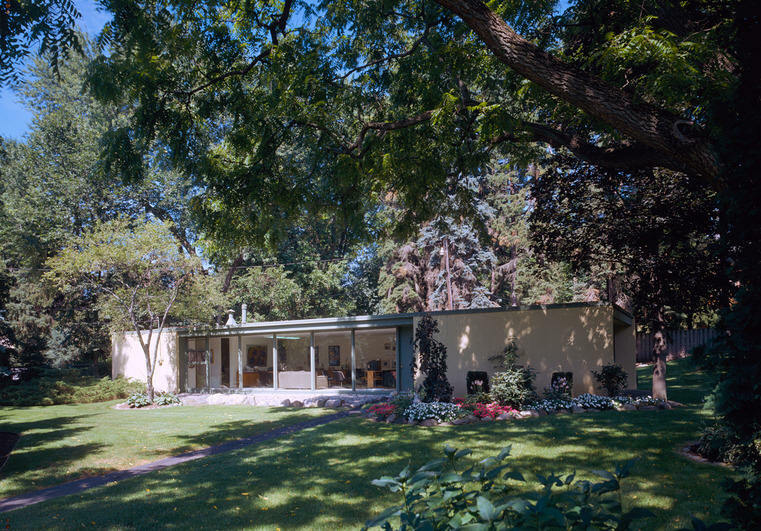 After Eliel Saarinen's death in 1950, Luja Saarinen moved from Cranbrook to the backyard of her son Eero's house, where he designed a modern guest house for her. 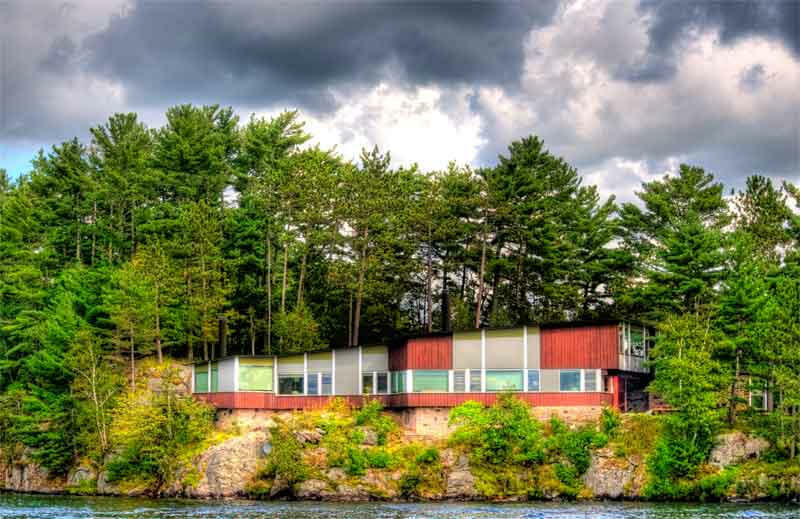 1952 - The J. Irwin and Xenia S. Miller Cottage, aka Llanrwst, in Muskoka, Ontario, Canada. Commissioned 1950. Top photo by Ed Boutilier. 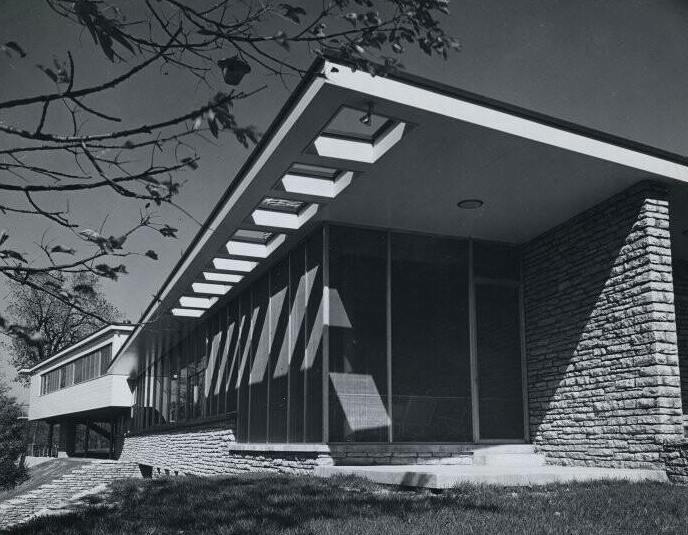 1957 - The J. Irwin and Xenia S. Miller House, 2760 Highland Way, Columbus IN. Landscape architecture by Dan Kiley. Commissioned 1953. Designed with Alexander Girard. 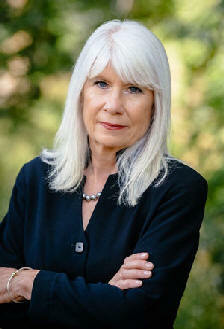 Xenia Miller gave the house to the Indianapolis Museum of Art which did an extensive restoration. Open for public tours through the Columbus Visitors Center. 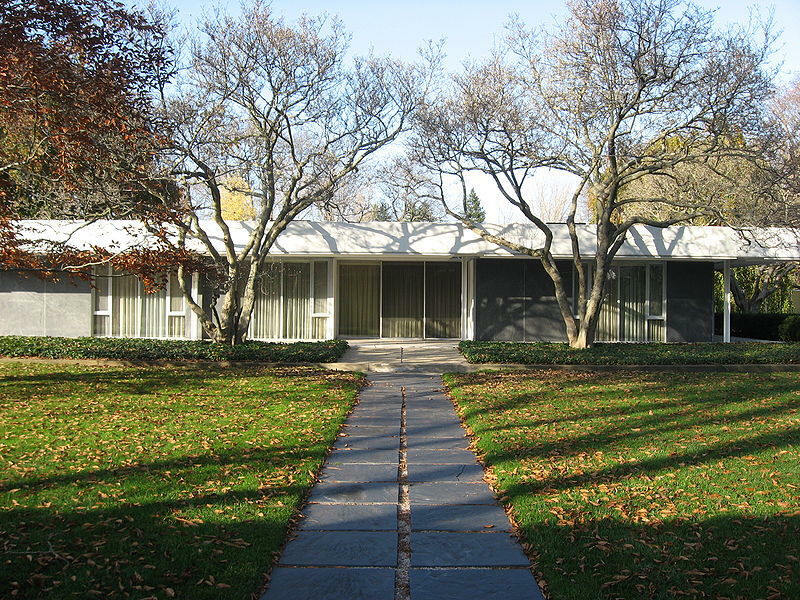 Sources include: Daughter Susan Saarinen, Finnish Cultural Institute on Saarinen.